We believe you should be able to access your presentations however and whenever you want, in whatever format you need. In that vein, today we launched "Save as PPT" which allows you to save presentations as PowerPoint. 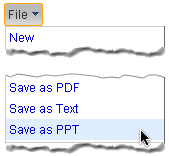 We now support PDF, PPT, and basic text as export filetypes. Of course, you can also share your presentations in several other ways: invite collaborators and viewers within Docs, publish your presentation (and share the unique URL to the presentation), or even embed your presentation on a separate website or blog. Have fun sharing!